MORGAN HILL, Calif.—Activists from the New California state movement wore yellow vests to attend a local town hall meeting on Dec. 8 and claimed they have joined the movement in France against socialism and globalism. 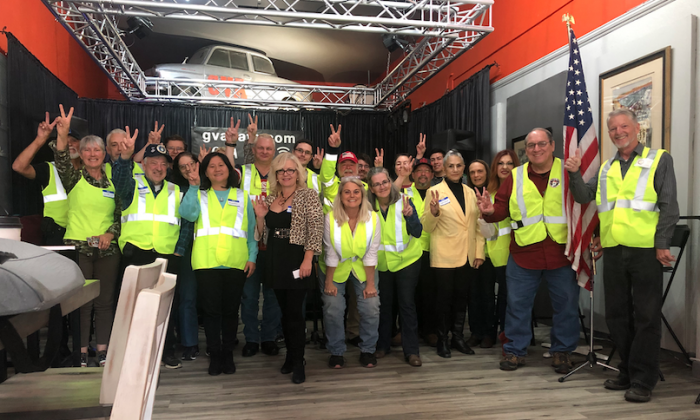 Standing together in a cafe in the small city in Santa Clara County, the crowd of American yellow vests posed with victory signs to express their confidence in the future of the Golden State. The New California state movement is an effort to split most of the rural areas away from the current state, and to form a new state. So far, 47 of the 58 counties in California have set up committees to join this movement, and another five counties have partial regions in this movement. “We stand in solidarity with French citizens,” said Liz Ritchie, one of the top leaders of the New California movement. “Our Constitution dictates us to do things peacefully,” said Paul Preston, the founder of the New California state movement. While wearing his yellow vest, Preston clearly drew the difference between his movement and some protesters in France who chose to participate in violence. Preston praised President Donald Trump’s effort to building border walls and criticized California’s sanctuary state policy as in violation of the U.S. Constitution Article IV Section 4, which protects each state in the union against invasion. Preston pointed out that “Agenda 21” was all about a small group of people using their power to control the weather, borders, populations, and the wealth of the world. Trump’s support for the yellow vests was also noted by the American yellow vests during Morgan Hill’s town hall meeting. “We see changes in Europe, and I attribute those changes to our President Trump,” said Ron Kirkish, an activist who is a retired drug prevention officer. “The socialist model in Europe is not working,” Preston also said, criticizing the socialist government elected by the French democracy. Preston compared the similarities of heavy tax and big government between France and California in his speech. The activists in the movement believe that California also has a socialist government. Preston pointed out that America has a republic instead of a democracy and is based on the Constitution. The activists for New California claim that California state has become a one-party controlled state, and therefore fails to comply with Article 4 Section 4 of the U.S. Constitution, which guarantees the republican form of government in every state in the union. California in recent years had two other efforts to split the state: the Cal 3 and Jefferson State proposals. Preston said the failure of these initiatives to follow the Constitution has caused extreme difficulties for them. Cal 3 proposed splitting California into three states, and was launched in August 2017 by American venture capitalist Tim Draper. Draper spent more than $5 million and gathered enough signatures to put Cal 3 as Prop. 9 onto the 2018 ballot. But Prop. 9 was removed from the ballot by the Supreme Court of California. Jefferson State proposed forming a new state by splitting 21 counties away from California and Oregon. The activists supporting this proposal have met strong resistance from the state legislature, and they recently started taking legal action to move the proposal forward. But the U.S. Supreme Court so far has chosen not to hear the case. “We are not just constitutionalist. We are the original constitutionalists,” said Preston. The activists in the New California state movement have so far, step by step, followed the Constitution Article IV Section 3, which West Virginia used to break away from Virginia in 1861. The movement claimed its independence on Jan. 15, 2018, which was the first step to form a reform government. Each county and fractions of counties attempting to break away from the current state have formed their own reform governments. Grievances have been filed on a weekly basis by the counties joining the movement. The grievances publicly announced have highlighted the reasons why the people in the movement believe they have not been represented by the current state government. So far 47 grievances have been filed and announced. A yellow vest symbol was used for the 47th grievance. The final split will need to be approved by the current state legislature and Congress. The activists believe the current California state government will soon face a fiscal crisis. When it happens, the movement will negotiate with the current state legislature and make a financial deal with it, using the rich natural resources of the new state.